September 10 — When hundreds of British Airways (BA) staff at Heathrow Airport downed tools on 11 August in support of 670 South Asian, mainly women workers sacked by catering firm Gate Gourmet, the whole world took notice. From Detroit and Dallas to Frankfurt and Sydney, newspapers reported that for two days members of the Transport and General Workers Union (TGWU) crippled BA and brought one of the worlds busiest airports almost to a halt. In the context of worldwide cutbacks, layoffs and union busting in the airline industry, this spectacular action gave a taste of the enormous social power that these strategically placed airline workers and their trade unions can bring to bear in defence of workers rights. It also dealt a welcome blow to the myth that class struggle no longer exists in Tony Blairs Britain of poverty pay and labour market flexibility. And it illustrated the treacherous legalism of the union misleaders, who brought the strike to an end while the workers remained sacked. The union and company are now negotiating over a voluntary redundancy package. Airline workers have considerable clout. Heathrow is strategic to British capitalism, commercially as well as militarily. Demonstrating the power of collective action by these workers, the Heathrow strike cost the bosses more than £40 million, grounded much of the BA fleet internationally and snarled up BA operations for nearly a week. It was all the more impressive in that the strike was undertaken in defiance of anti-union laws forbidding solidarity strikes with workers in different companies and was launched in the teeth of the governments war on terror hysteria whipped up in the aftermath of the 7 July criminal terror bombings. The governments anti-terror campaign singles out the countrys darker-skinned minority population in order to divide the working class. But at Heathrow the workers gave a splendid demonstration of how class solidarity can transcend ethnic lines, with the integrated workforce, including ground crew workers, recognising that their own interests and those of the more vulnerable and mainly female and Asian catering workers were the same. Targeting Muslims in the first instance, the governments war on terror is designed to regiment the working class, to discourage opposition to the imperialist occupation of Iraq and as a club against all perceived opponents of capitalist rule. Any Muslim, Sikh, Brazilian, African or anybody else deemed a terror suspect can be shot by trigger-happy, racist cops — as was seen in the brutal killing of Brazilian immigrant electrician Jean Charles de Menezes, who could have been just about any worker on his way to work. The TGWU and other unions must oppose the war on terror, both as an elementary act of defence of the rights of their own multiethnic membership and to defend the unions as organs of collective struggle. The working conditions of Gate Gourmet workers are familiar to millions of other workers in dynamic, 21st-century capitalism. In 1997, BA contracted out their catering to Gate Gourmet, the worlds second largest in-flight catering supplier. BA constantly demands productivity increases from Gate Gourmet, squeezing workers to do more work for less pay. Contracting out is designed to carve up the working class and prevent unified strikes across a single industry. Today, Gate Gourmet workers earn a paltry £12,000 per year, which is not a living wage. But even this is too much for this company. An exposé in the Daily Mirror (16 August) revealed that Gate Gourmet has been implementing a union-bashing scheme code-named Operation Milestones, for which a Gate Gourmet director set up a scabherding operation named Versa Logistics, specialising in recruiting Eastern European and other immigrant workers. When management hired casual workers at Heathrow, workers saw the writing on the wall and staged a protest — the action for which they were sacked by the company. Gate Gourmet is trying to use immigrant workers from Eastern Europe and Somalia, who earn £6 per hour with no entitlement to state benefits, as a club against the Gate Gourmet workforce who, as British citizens or permanent residents, are entitled to sickness pay and benefits. And unlike most workers in low-paid, contracted-out work, they are organised in trade unions and have family and union ties to other airport workers. The mass sacking by Gate Gourmet is an attack on the very existence of trade unions at Heathrow Airport, which according to the Financial Times (19 August) is the largest remaining bastion of unionised labour in the country. The TGWU is the largest union there, with over 20,000 members out of a workforce of 70,000. The fight to reinstate Gate Gourmet workers is an issue for the whole trade union movement. The response by BA ground staff was precisely what is needed: decisive class struggle, in defiance of the anti-union laws, that shut down the entire airport and hit the greedy airline bosses where it hurts — in their bottom line. Airport workers took this action knowing their own jobs could be next on the line — BA is determined to root out the airport unions as part of sweeping changes in preparation for moving to the new Terminal Five in 2008. There is a history of mass firings at Heathrow: 270 unionised catering workers were fired in one fell swoop by Lufthansa Skychefs catering in 1998, for having staged a one-day strike. The solidarity strikes at Heathrow sent shockwaves through BA, not to mention the viciously anti-working-class Labour government. With Heathrow virtually at a standstill, and BA losing millions in profits, the union leadership repudiated the strikes as unlawful and workers went back to work. TGWU general secretary Tony Woodley justified this treachery, bemoaning the fact that solidarity strikes are unlawful in Britain, as opposed to elsewhere in Europe, and pleading that it is time to bring solidarity action within the framework of the law (Guardian, 16 August). But the powerful solidarity strike by Heathrow workers, which crippled operations at this major international air hub, exposed the lie of the bosses and their Labourite agents that the workers are helpless in the face of the governments anti-union laws. The workers demonstrated the potential of militant class struggle to render these laws inoperable. It was Woodley & Co who acted as the labour lieutenants of capital in enforcing these laws. With BA and the airport back in business, the TGWU leadership — aided by the Trades Union Congress and Labour government ministers — agreed to negotiate, from a position of weakness. The TGWU leadership support the capitalist Labour government and the interests of the British ruling class —the very forces the unions have to mobilise against to defend workers. Grotesquely appealing to British patriotism against the American-based Gate Gourmet, Woodley asked, Can a company walk into Britain and plan the cynical sacking of innocent men and women to cut costs and be legally allowed to get away with it? (Guardian, 23 August). He called on British-based BA to step in and help the sacked Gate Gourmet workers get their jobs back at Heathrow (BBC News, 22 August). Appealing to the capitalist bosses or their government, or viewing them as potential partners, is the kiss of death in class struggle, where it is critically important to know who ones enemies are. The key question for airport workers facing union-busting attacks is to forge, in the course of class struggles, a new leadership in the unions that will not play by the bosses rules or buy into the bourgeoisies national unity hysteria, which was used to stop the striking firefighters on the eve of Bush and Blairs invasion of Iraq. Against Gate Gourmet and other companies attempts to pit immigrant workers against other workers in Britain, the unions must organise the unorganised! A class-struggle leadership would champion the fight for full citizenship rights for all immigrants! The fight for such a leadership is linked to building a new, revolutionary party of the working class. We of the Spartacist League/Britain are fighting to build a multiethnic revolutionary workers party. This is not to be some warmed over version of the old Labour Party that for decades betrayed the interests of workers and minorities. Whats needed is a party founded on the understanding that working peoples fight for their own interests must culminate in a socialist revolution that overthrows capitalism and replaces it with an international, rationally planned economy that will consign unemployment, poverty pay and racism to the dustbin of history. Adapted from Workers Vanguard no 853, 2 September 2005. US/British troops out of Iraq now! 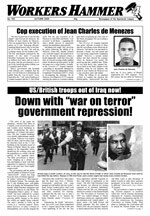 Down with "war on terror" government repression! For a revolutionary socialist programme to liberate humanity!